Sikunir hill is a good place for any sunrise chaser! You need to go early morning to see the sunrise view. The path into the top is quite tough (you must wear any good-hiking-shoes and bring sufficient water here). It takes 30-45 minutes to hike to the top. But, the view is breathtaking. Starting from the sun comes up until it shine bright, it made all the sweats are worth it! You also can see Mount Sindoro and Mount Sumbing from up there. There are also some stalls selling delicious fried stuff and steamed potatoes that goes along with a cup of coffee, highly recommended! Note: We suggest you to go here at 3am and choose weekday, so you don’t have to worry will stuck in the crowd of many tourists. 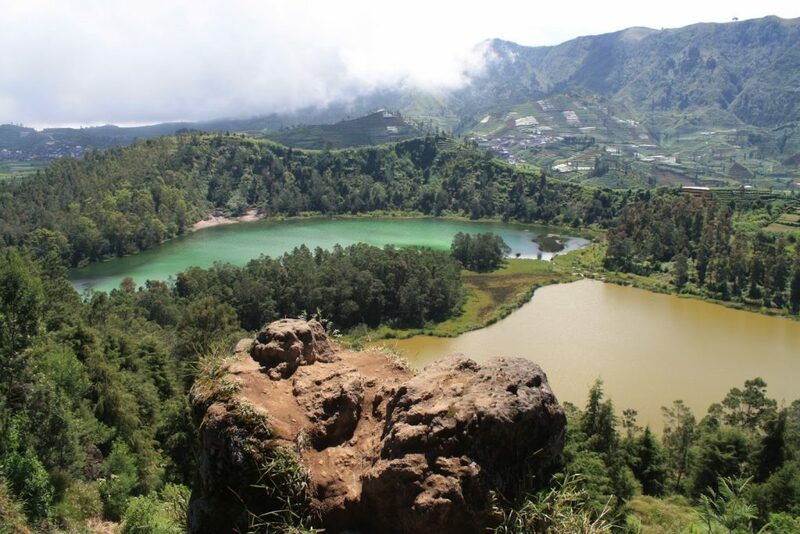 This lake was formed due to the explosion of Dieng Mountain back then. Being affected by such great blast, the land turned into a giant crater and was filled with water over time. 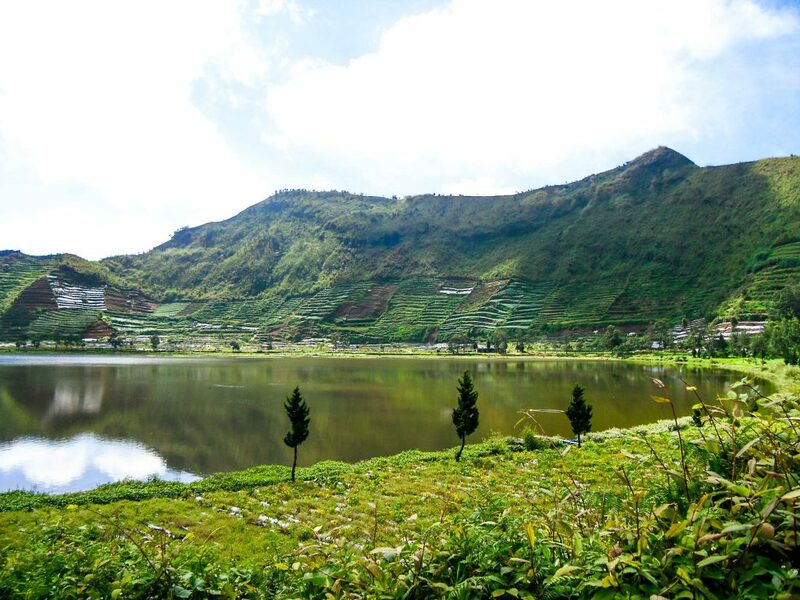 The locals even believe it as the biggest lake in Dieng Plateau, as compared to others. Thanks to its stunning landscape. Photography is common in Merdada Lake and almost all visitors carry their camera when visiting the site. Due to its size, the lake offers many recommended spots to take pictures, as well. What’s next? Another recommended activity is kayaking! Some locals offer kayak service to tourists and it comes at a cheap price. 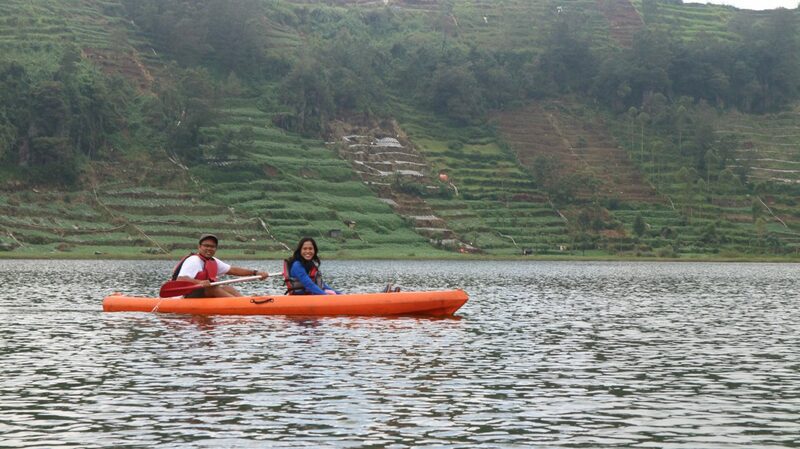 This way, everyone can enjoy riding the kayak and explore the lake comfortably. They might also meet the locals who look for fishes on the lake. What a sight! With all those interesting charms of Merdada Lake, it is definitely a worth! Padang Savana Dieng is our most favorite spot! This savanna resides near to Semurup Valley. The location is the foot of Pangonan Mountain and it will offers peaceful nuance to you. Surrounded by yellowish green bushes and grasses, the site looks exotic and comfortable. The name Semurup derives from “Summer Up”, actually. It is because the color of the grasses changes into yellowish during summer. You can do many things here, including sightseeing and hiking. From the location, you can see Merdada Lake and the view of lush cemeti trees, including swamps and weed grasses. All of them will be a nice background for you insta-feed! 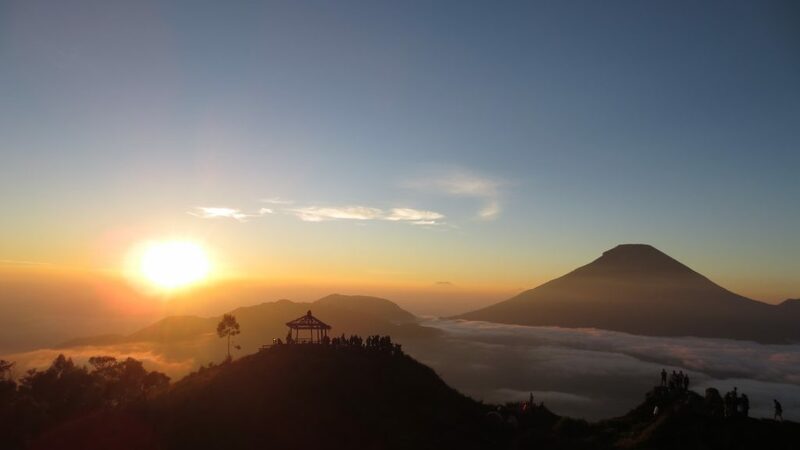 The other reason to visit Dieng Savanna is the hiking opportunity. You can do a small trekking in order to reach the location. Several routes are available depends on the difficulty, but the most popular hiking spot is located in Karangsari Village. It is considered the most comfortable one, so beginners can enjoy the activity. Above all, it is also the shortest one because you only need to spend 20 minutes of trekking to reach the savanna. 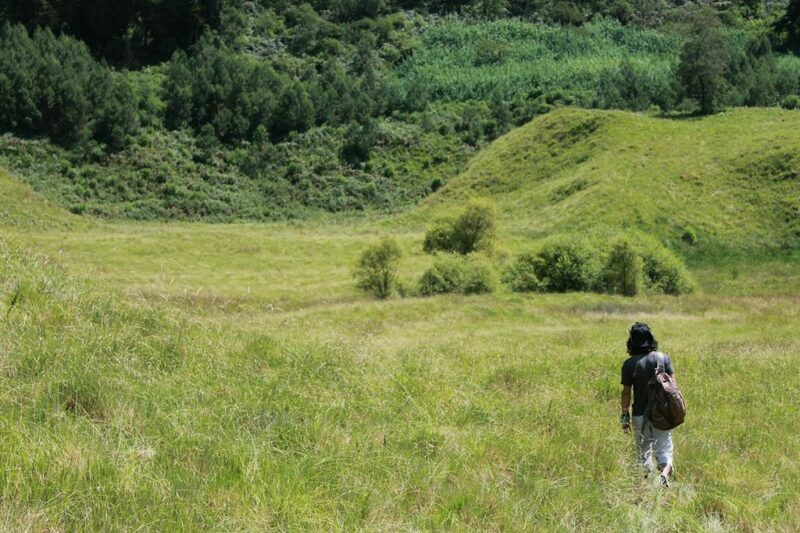 Another fun activity to do in Dieng Savanna is camping. Many spot here offers the best views of sunrise and sunset. It will be perfect for you who love to taking pictures and sightseeing! Note: Use your comfortable shoes if you want to go here! An unspoiled beauty of nature and majestic falls await you here! Curious enough? First, answer this: “Do You want to see the presence of wild nature and feel its refreshing nuance?” Saying ‘I do’ already? Yeay! Means Curug Sirawe is the answer for you! You can get closer to nature and enjoy the view of a breathtaking falls at the same time. It is a good location to take all the burdens and stresses away! 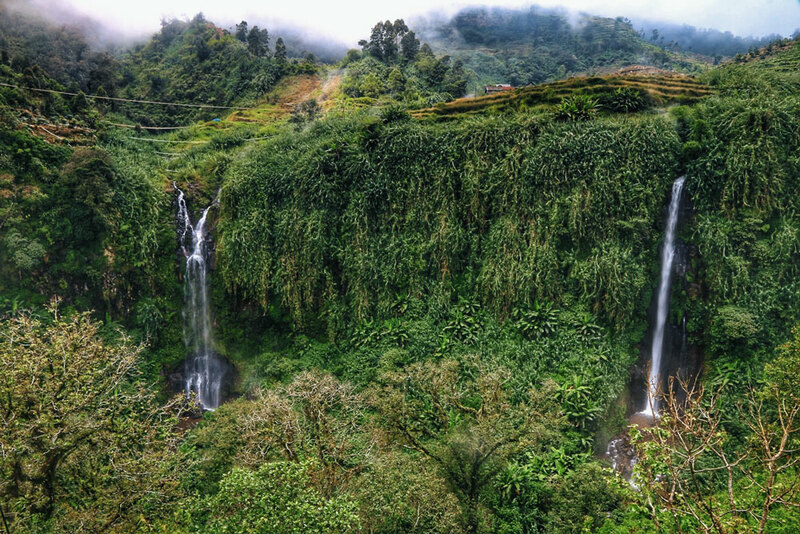 The height of Curug Sirawe is approximately 80 meters. There is a small natural pond below, on which you can get in and refresh yourself. The small pond is suitable for swimming and playing water, after all. Moreover, some plants and trees grow abundantly in that site, providing a calm and comfortable atmosphere. Even the air feels so great! All of those features become a perfect object for photography, as well. Thus, you shouldn’t forget to carry a camera when visiting Sirawe! Entry Ticket: Free at weekday, Rp 5.000,- at weekend/holiday. Note: You’ll need to do a small trekking to reach the spot. Use your comfy shoes is a must! There is a hot spring close to the parking lot where you can go after your trip to Sirawe. Ratapan means “a wail” and Angin means “the wind”. Yes, it comes from the breezy wind that sounds like a moan or also a murmur. No wonder, it feels a bit chilly up there. Before reaching those stones, you must have prepared some items especially a jacket. Wearing comfortable shoes and carrying bottled water are also recommended, as the way to go to the landscape is quite challenging. Arriving at the top of the stones, flawless views of nature are seen majestically. The best scenes are indeed Pangilon and Warna Lake, showing their contrast color. The scenes will appear even better when the sun rises! Entry Ticket: Rp 10.000,- for local tourist and Rp 30.000,- for foreign tourist.